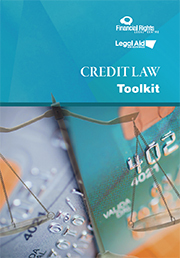 This latest version of the Credit Law Toolkit covers the law as at December 2015. This toolkit is not meant to cover every technical aspect of the Credit Law. The intention is to cover in detail those parts of the Credit Law that caseworkers regularly use when advising consumers. Different parts of the Credit Law commenced operation at different times. This is explained in more detail in the section When the Credit Laws apply? This toolkit is aimed at both financial counsellors and lawyers, particularly those lawyers in legal aid offices and generalist community legal centres who do a range of civil law work, but do not necessarily specialise in credit law. This toolkit is intended to assist financial counsellors to assist their clients more effectively, but not to replace timely legal advice. Generalist lawyers should also consider consulting a specialist credit lawyer if they are unsure about the application of the law to a client’s particular circumstances, or the best strategy to pursue. All caseworkers should pay particular attention to the relevant time limits for taking action noted throughout this kit. An important part of the work of a caseworker is solving the consumer’s problem. The Credit Law requires that all credit providers and those arranging credit must be a member of an approved External Dispute Resolution Scheme (EDR). For this reason, this toolkit concentrates on using EDR to resolve consumer disputes/problems and not court. Court is a last resort and it is recommended that legal advice from a lawyer with appropriate expertise be obtained before going to court. We have tried to cover the most common client situations in this toolkit. In reality, clients present to caseworkers with an endless variety of circumstances and questions. Remember: If you have a tricky consumer credit problem - get legal advice.